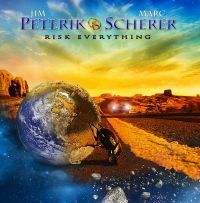 Famous musician amd song writer JIM PETERIK has a way of turning most things into gold, just not as much gold as his 80´s classics “Eye of the Tiger” and “Burning Heart”. Singer/Song writer Marc Scherer was active way back with the band H.P. LOVECRAFT, but has been in sort of retirement for years and remained in obscurity until he and Jim started working together around 2010. I don´t think the album title is fair as this outing will not risk a single think, unless they are referring to illegal downloading? The title track is a strangely lukewarm affair, showcasing Scherer´s archetypal 80´s voice, which no doubt draws comparison to just about everything Jim´s been involved in. To my surprise notyhing much changes with “Chance of a Lifetime”. Apart from all the vibes of times bygone as not many dares to make this kind of positive music anymore. But things do change. They really hit it on with the likes of “Cold Blooded”, “Brand New Heart” and “Your Independence Day”. All three harks back to SURVIVOR and their halcyon days, but all three are the stuff of legends nevertheless. Unfortunately there are songs like the opening pair and the less exciting yet touching “Broken Home”. In spite of the bonus points for making the best out of Dylan Thomas´s poem (“The Dying of the Light”) this is an average album that yet shows signs of massive potential.